A key performance indicator (KPI) is a metric used to evaluate factors that are crucial to the success of an organization. Usually these factors are represented by normalized numbers (e.g. 0-100%) and maximizing or minimizing them is equivalent to making progress toward operational or strategic goals of the organization. Different KPIs of variable levels of complexity exist, rating factors such as customer and employee satisfaction, compliance, security or economic success. 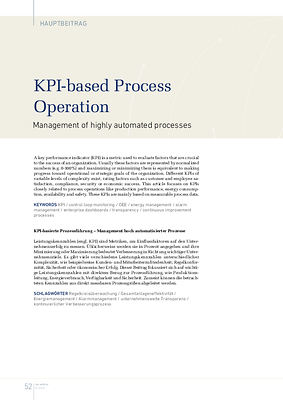 This article focuses on KPIs closely related to process operations like production performance, energy consumption, availability and safety. These KPIs are mainly based on measurable process data.